"Antonio Puri: Outside the Mandala"
Ultimately, Puri's�art form engages the viewer in an active level of deciphering and imagining the works in various stages of completion. As Puri writes in his artist statement, �by contrasting �highly textured surfaces with flat surfaces, vertical and horizontal drips, circles of different proportions a tension develops. This tension is the force that keeps the paintings alive.� Many of the paintings on view in Outside the Mandala were created while Puri was a part of the chashama artist-in-residence subsidized space grant in New York. Puri was born in Chandigarh, India, and spent the first 17 years of his life in international boarding schools in the Himalayas. He came to the United States to attend Coe College in Iowa, where he majored in art. Puri also studied at the San Francisco Academy of Art and attended the University of Iowa School of Law where he earned his JD. �Puri has had several solo exhibitions including Weiss Pollack Gallery, New York; chashama, New York; Holland Art House, West Chester, PA; Gloucester County College, NJ; Cumberland County College, NJ; and Planet Art Museum, South Africa. He has also exhibited in numerous group exhibitions including the Susquehanna Art Museum, PA; Bergen Museum of Art and Science, NJ; The Noyes Museum of Art, NJ; Sharadin Art Gallery at Kutztown University, PA; Rowan University, NJ; and Som Arts Cultural Center, San Francisco, among many others. His work is also represented in museum and corporate collections and he is currently planning for two large-scale exhibitions in 2006 at West Chester University, West Chester, PA and the Noyes Museum of Art in Oceanville, NJ. 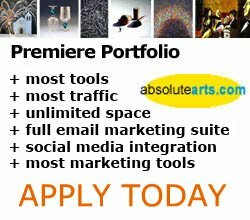 As an orginal member at absolutearts.com, Antonio Puri has promoted his work with an Artists Portfolio since 2000. View more of his work at http://www.absolutearts.com/portfolios/k/kantonio/.